Luckily, heart disease is not something we see commonly in veterinary practice. As you can imagine, heart disease has the potential to be serious, and early diagnosis and intervention are important. What are the signs of heart disease ? With dogs, owners may notice a rapid decline in ability to exercise, general lethargy, loss of appetite, weight loss and coughing. Cats tend to be much more deceitful about heart problems, as their very nature demands that they hide illness as much as possible (for they are hunted by larger animals in the wild). To this end, cats tend to gradually slow down and make themselves scarce. Weight loss is often apparent after a period of months. Only when the disease has reached a critical tipping point do they show respiratory signs such as panting and open mouth breathing. Things are usually quite advanced by the time we have such obvious symptoms. It is important to note that (for both dogs and cats) all of the symptoms of cardiac disease are similar to dozens of other illnesses. 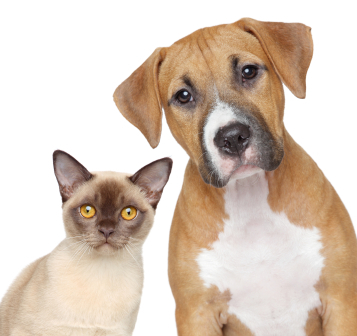 The history and physical exam go a long way to help diagnose cardiac disease in cats and dogs. Additional testing such as chest x-rays and specialized bloodwork may further our understanding of the severity of heart disease. The most thorough method of evaluating heart function is via cardiac ultrasound, also known as an echocardiogram. This testing is typically performed by veterinary cardiologists at a referral centre. Can it be treated ? Most forms of cardiac disease can be treated. That’s not to say that they are fixed or cured. Most heart disease that we see in dogs and cats progresses over time. Medications, often several given concurrently, support heart function for as long as possible. Please contact us if you have a concern about your pet and heart disease.